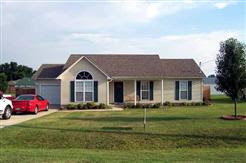 Here is a new Fannie Mae foreclosure in the Dyersburg area. It is a 3 bedroom 2 bath vinyl sided home with 1494' heated and cooled area. The property was last purchased on 8/30/07 for $101,000 and is currently priced at $104,900. The state has the property appraised at $109,400. A company out of Trenton has the property listed but I can show and sell you this property. The listing can be seen by clicking the Fannie Mae button over on the right side. My direct cell phone number is 731-589-7841.